Olympics: celebrating Britishness? | PaulJ's bench………. Thoughts on politics, sport, the universe and everything. The achievements of British athletes at Beijing, from all parts of the UK, are something in which all of us can take pride, regardless of where we live in the UK. At a time when Labour’s ruinous devolution policy has placed the future of the UK in greater question than at any time since 1746, the Union needed just such a shot in the arm. We didn’t care who was Scottish, who was Welsh, who English or from Northern Ireland – they were all ours under our common flag and our national anthem. 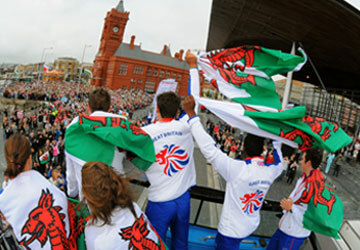 So why are these athletes being welcomed to Cardiff draped, not in the Union Flag under which they competed, but in Welsh flags instead? No celebration of Britishness there!! On the TV coverage I saw one solitary person in the crowd waving a Union Flag. All the rest had either brought – or been issued with – Welsh flags instead. And the asinine BBC commentator person even went so far as to refer to one athlete as ‘winning Wales’s first gold medal since (whenever)’. How long before the arch-showman Salmond stages a similar Nationalist/Separatist rally in Edinburgh? And will London 2012 still have a TeamGB supported by Union Flag waving supporters as in Beijing? After all it was only thanks to the Chinese authorities’ concerns about pro-Tibet demonstrations that flags of ‘non-competing nations’ were banned and we were spared a rash of saltires etc. there. Not surprisingly Brown has been caught napping here. We are told there is to be a celebration for the British Team in London in NOVEMBER! By which time the devolved administrations will have had loads of time to undo the good work for the Union that might have been achieved by staging their own celebrations such as this, with their own separatist message. Why am I banging on about this? After all, it’s just symbolism, isn’t it, with no real substance? Simply because I am worried about the future of the country I grew up in. Basically, I want it to have a future. And because I realise, as do the Alex Salmonds of this world, that symbolism is important. It creates the atmosphere in which what was unthinkable thirty or forty years ago becomes thinkable even to the point of seeming to some people right and inevitable. I remember Wales and Scotland in the 1960s when dragon flags and saltires were relatively rare. Now they’re just about ubiquitous and the rarity is the Union Flag. Elected as Conservative councillor in Surbiton Hill, Kingston upon Thames in 1998. Re-elected 2002 and 2006. Former parliamentary candidate in Lancashire and Birmingham. Ceased to be a Councillor (temporarily?) in 2010. Active among Residents' Associations in Surbiton Hill and among residents in social housing generally. Former teacher of History at St. Brendan's College Bristol and Head of History and Politics at the London Oratory School. Worked with Sutton Trust running summer schools for sixth formers at Oxford University from 1997-2000 aiming to improve uptake of places from pupils from state schools which sent very few applicants to Oxbridge. This entry was posted in Labour, Politics, Sport. Bookmark the permalink. 1 Response to Olympics: celebrating Britishness? Totally agree Cllr. Johnston. When there is so much we as a nation have much to be embarrassed about, the winning of so many medals this year by Team GB was surely something to unite us all in national pride. However, one wonders why Labour doesn’t treat education the same way it does sport – by supporting higher-achieving kids in Grammar Schools where they can best excell rather than trying to dumb down everyone to a common comprehensive standard. When will our kids learn that it’s a really competitive world out there – only when they watch the dim-wits on Big Brother competing for attention and 15 minutes of “fame”?